*Data for Nunavut not available. Source: CICH graphic created using data adapted from Canadian Institute for Health Information. Children Vulnerable in Areas of Early Development: A Determinant of Child Health. Ottawa, ON: CIHI; 2014. https://secure.cihi.ca/free_products/Children_Vulnerable_in_Areas_of_Early_Development_EN.pdf -accessed July 24, 2017. The majority of children in Canada are doing well on each of the five Early Development Instrument (EDI)** areas of development (communication skills and general knowledge; emotional maturity; physical health and well-being; social competence; and, language and cognitive development). Overall in Canada, one in four children (26.7%) is vulnerable in one or more areas of development prior to entering Grade 1. Girls were less likely to be vulnerable at age 5 than boys. 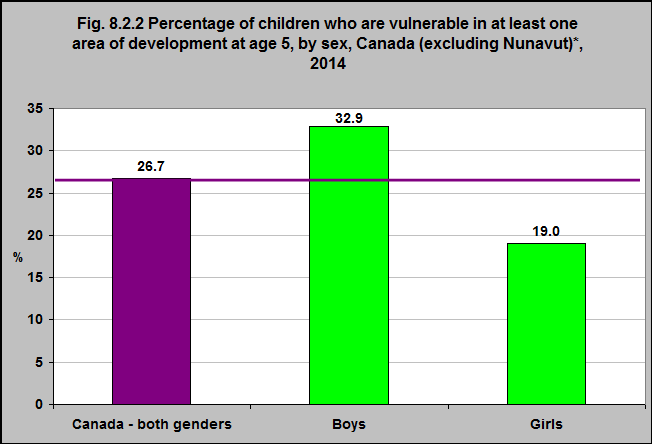 32.9% of boys in Canada were vulnerable in one or more areas of development compared with 19% of girls.